The light & atmosphere of London always stops me in my tracks. The way it reflects off the buildings on bright days and more commonly, the way all the diffused natural light softly graces the architecture, gardens, and faces. The brisk summer air and light drizzle don't keep this city from buzzing because there is so much to experience. When I go to London, there are four rituals I must do, that I'm sure originated from my childhood days spent stationed at Royal Air Force Lakenheath: Uncle Dana + Aunt Lin visits, explore historic sites, tea time, + Harrods. First, one must ALWAYS see Uncle Dana + Aunt Lin. Full of love + life, these two camped out with my brother and I in backyard tents, let us feed the foxes, and now, treat us to Pimm's Cups and Fries with Eyes. While I only had a short visit with them, our afternoon in Hyde Park was one of the best visits I've ever had, and I'm banking on a visit in the next year to see the both of them again! Second, we have to explore a historic site because they are rich and educational experiences. 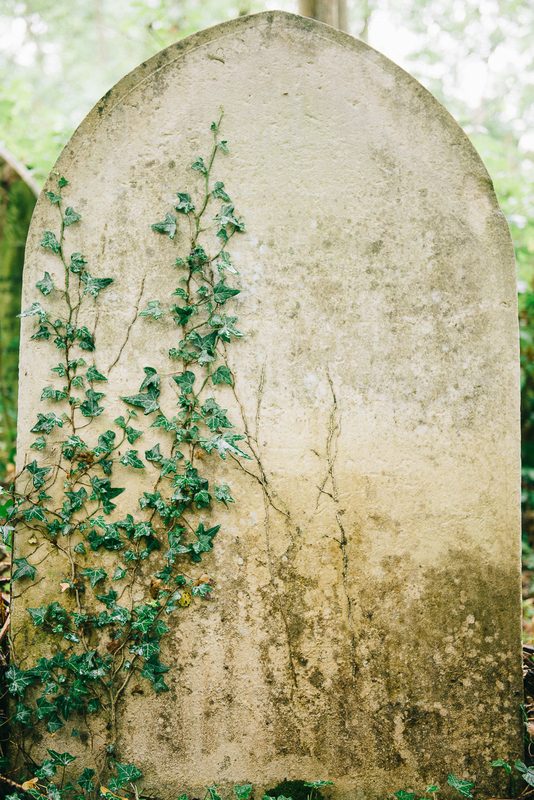 This time, we ventured out to Highgate Cemetery, where piles upon piles of gravestones lie atop each other wildly covered in ivy. There are over 53,000 graves with 170,000 burials in the 37 acre cemetery. Known as one of London's most fashionable cemeteries, Karl Marx, Douglas Adams (author of the Hitchhiker's Guide to the Galaxy), pop artist Patrick Caulfield, George Eliot, + William Friese Greene rest here, as well as many other authors, politicians, musicians, and notable names. In 1839, Parliament founded the East + West cemeteries of Highgate because of the high mortality rate and lack of burial space. In the 1970s, the cemetery took a turn for the worst, as families died off no longer tending to their loved ones' resting places and vandalism took over. Now, the cemetery, which is controlled by a trust, is a site to behold if you go to London. Our next "historic" site was, but of course, Platform 9 and 3/4 at Kings Cross Station. Because...Harry Potter. And the architecture is beautiful in this station. Go Gryffindor! Tea is our third ritual when visiting London. This time, Tess + I searched for the coolest place, and through researching, "London's 30 Most Instagrammed Restaurants," we ended up at Sketch, and added to their Instagram fame. Think art gallery meets high tea. There are seven rooms that make up Sketch, each designed by a different artist partnered with a fashion designer who helped complete the visual experience of this restaurant-gallery fusion. Aside from the lovely champagne and jasmine pearls green tea, the egg salad sandwich topped with a quail egg + caviar, was one of my favorites. We were soooooo high society (put pinky finger up in the air). We also managed to use the loo inside an egg in the coolest bathroom ever, which of course, is on another viral "must" list. Of course, what better to do in London after tea than to go shop at Harrods! I love walking around their gourmet foods dragging my jaw along behind me. And then I get to their art gallery + do the same thing. Harrods speaks for itself and all of it's glory, but I only have some photos of my favorite things about this supersize luxury department store: design, art, + food. And, of course, I can't do a post without talking about our food. Outside of the phenomenal tea at Sketch, and our steak dinner at Harrods, we ate a lovely breakfast of ricotta cakes with banana and honeycomb with flat whites at Granger & Co. Then, went to In Parma by Food Roots off Charlotte Street for charcuterie + pasta for dinner another night. Nothing beats cured meats hanging from the ceiling...nothing. Up next: markets, food, + more art!